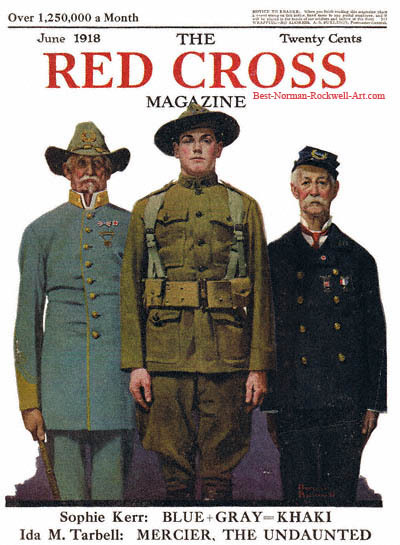 This Norman Rockwell painting, entitled Veterans of Two Wars, appeared on the cover of Red Cross magazine on the June 1918 issue. This was the second picture by Rockwell to appear on the Red Cross cover. Red Cross published a total of four Rockwell illustrated covers, between 1918 and 1920. Rockwell only submitted his pictures to this and other smaller magazines after the publishers of the larger magazines had declined to publish the cover illustration. Veterans of Two Wars was only one of many magazine covers that Rockwell painted. This painting was conceived during the height of the First World War. The war was soon to be over in June of 1918. Nobody, including Rockwell, knew this however. The caption under this painting, "Blue + Gray = Khaki," refers to an article inside this issue. It is fitting as a subtitle for the painting, though. The subjects of this painting are veterans. The two veterans on either side are both soldiers who served either side during the War Between the States. This is commonly known around here as the War of Northern Aggression. We see one Union uniform. This former soldier was awarded several medals. This appears to be a dress uniform since he wears a necktie. On our left we see a former Confederate soldier. He wears his dress uniform also. A quick glance shows several medals pinned on the breast of his coat also. In the middle is our current soldier. He is all ready to ship off to Europe to fight for the Allies. He has not earned his medals yet. Hopefully the young soldier will survive the war. Then he can take his rightful place with the others as a former soldier. This cover, like many others of the era, bears a notice to the reader in the upper right-hand corner. This notice, from A.S.Burleson, Postmaster General, informs the reader what to do after finishing with the magazine. After she finishes, she can affix a one cent stamp to the magazine. Then the Postal Service will deliver it to a soldier or sailor.